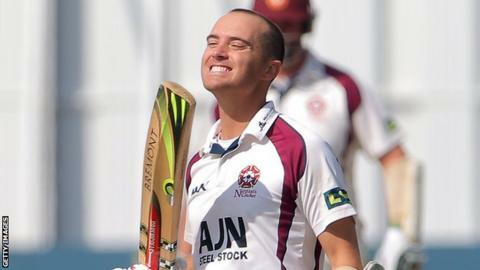 Northants openers Stephen Peters and James Middlebrook hit half-centuries against Kent, although the game still looks destined to end in draw. But they are in the driving seat in their promotion bid, with third-placed Essex's game heading the same way. In a match which has already been badly affected by the weather, Northants could only reach 15-0 in response to Kent's 418 before rain forced them off. When it resumed, Middlebrook (87no) and Peters (68) saw them close on 183-1. Skipper Peters was caught by Daniel Bell-Drummond off the bowling of Mark Davies after an impressive 136-run first-wicket partnership with Middlebrook. Having started this round of games 21 points ahead of closest rivals Essex, second-placed Northants remain on course to be promoted to Division One alongside table-toppers Lancashire. Only a disastrous defeat against Worcestershire, coupled with Essex hammering Hampshire, could provide enough of a points swing to deny Northants promotion. "With so much time lost in this game to the September weather, anything other than a draw is unlikely. "Northants are well placed to push on for maximum batting points and maintain their promotion differential over Essex. "Kent look to be heading for yet another rain-affected draw. At least the maximum bonus points Kent gained batting will lift them away from the wooden spoon position at the bottom of Division Two. "If Kent do finish at the foot of the table it would be harsh on a side boasting three players [Rob Key, Darren Stevens and Brendon Nash] posting 1,000 runs for the season."